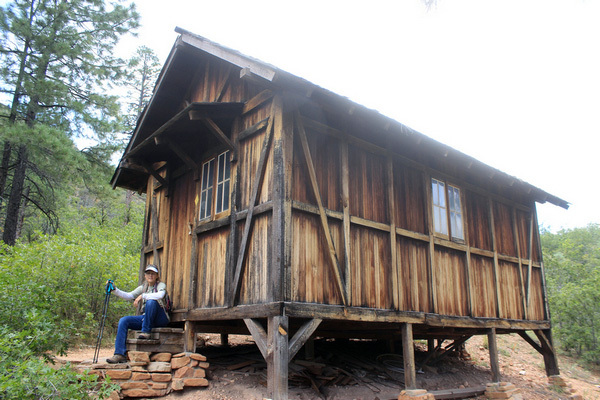 This historic ranger Cabin is located on a short spur off the North Bass trail approximately one mile below Swamp Point on the Grand Canyon's North Rim. 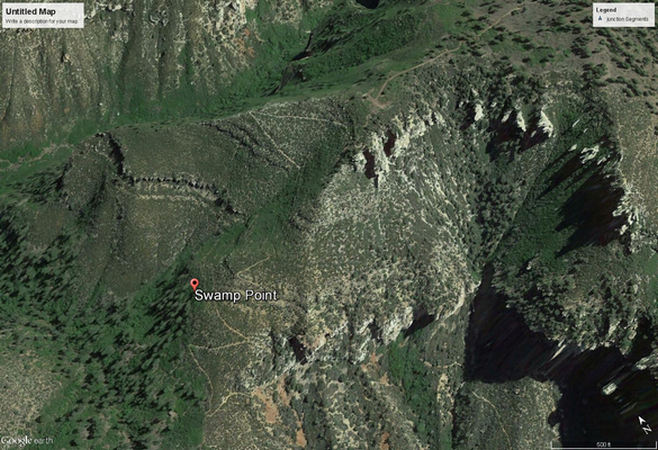 In the 1890's, Swamp Point was on a cross-canyon route created by William Wallace Bass. Mr. Bass, who was one of the earliest "tour" operators in the canyon, would bring visitors down on mules or horses from the South Rim to the Colorado River. The trail that he used would later be known as the South Bass Trail. At the river, Bass would either ferry or tram his customers across the river to his north side trail where they would top out on the North Rim at Swamp Point. From there the tours would continue on to Point Sublime 9 miles or so to the southeast. The best access to Swamp Point today is on roads south through the Kaibab National Forest to Swamp Ridge Road in Grand Canyon National Park. The forest road through the Park boundary is 268B. This photo, of the boundary gate area, is where FS 268B crosses into Grand Canyon National Park. As with the other areas of the North Rim, it is only seasonally open from May to November. From what I understand there may be additional delays in re-opening the road if there are downed trees across it that must be removed. This entrance to Grand Canyon is not like those in the developed areas of the park! The difference in forest management styles between the Forest Service and the National Park agencies is evident. On the National Park side of the forest, the vegetation is very dense. There is little evidence of any clearing or thinning of undergrowth. Downed trees and brush are left to accumulate. On the National Forest side, thinning and clearing activity is obvious. This a view into the forest on the Park side. Swamp Ridge road is rated for vehicles with high clearance. I do not know if I would drive it without having 4wd available. We were in the area in August, one of the rainy seasons. I was surprised that the roads were not more muddy. I have read that mud can be an issue in this area. The road is not particularly well-maintained. This is the parking area at Swamp Point. This Google Earth view shows the parking area at the end of Swamp Ridge Road and the switchbacks in the uppermost section of the North Bass Trail. The roof of the cabin can be seen in the lower left portion of the photo. The scenery out toward the Canyon from Swamp Point is outstanding. Starting from the east is this view of Muav Canyon. The North Bass Trail is in this drainage. The South Rim is the horizon line in the far distance. Just a bit to the west of the previous photo, is this view of the Powell Plateau. John Wesley Powell supposedly said that the best views of the Grand Canyon were from the top of that plateau. As one turns further west from the view of the Powell Plateau, there is the scene down Saddle Canyon. Steamboat Mountain is in the center of the photo. At the edge of the point is the trailhead for the North Bass Trail. The cabin is down the trail approximately 1 mile. It is on Muav Saddle, the divide between Muav Canyon and Saddle Canyon. The switchbacks were quite moderate in their grade. Over the years I have been on many other Grand Canyon trails. My wife had not. I was excited to have her walk this route to see what a "real" Canyon trail was like. This would not be one of the manicured Corridor Trails that the majority of Grand Canyon travelers hike. Although we would walk only a short distance, I was sure that she would get a feel for what the remote canyon trails are like. The cabin is tucked away in the trees of Muav Saddle. It is not actually visible from the trail once down onto the saddle. The cabin was constructed by the Parks Service in 1925. Its official designation is "Muav Saddle Snoeshoe Cabin". It is apparently also known as "Teddy's Cabin". Teddy Roosevelt is said to have camped at this spot where the cabin was later built. He was in the area hunting lions. I have not been able to find out how the cabin was used. Were rangers once stationed here, or was it used by personnel when they were in the area on their patrols? The two-room cabin is sparsely furnished with just a couple of bed frames and a small table. It is very clean and I think would serve well as a temporary shelter. The current log book for visitors was put in place in 2011. Approximately half the pages have entries. While we were looking around at the cabin, the weather changed. The sky darkened and it began to sprinkle. We decided that it was time to leave and quickly made our way back up the trail. We did arrive at the truck before it really rained. It had been a great day! We had seen one other vehicle on our drive out to Swamp Point. There had not been any other people on the trail. That was probably not the situation at any of the developed view points or too many of the other trails elsewhere in the park! Historical information on the South Bass Trail can be found here. A historical summary of the North Bass Trail can be found here.